In this story, First Nations technology of the past is contrasted with First Nations technology of the present. 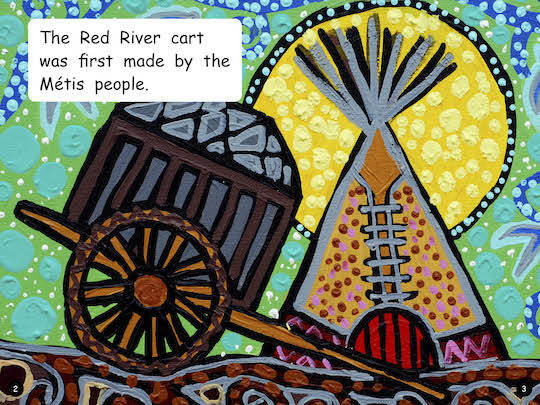 Many illustrations show how inventive First Nations people were in their use of the environment. The addition of present-day technology shows how adaptive First Nations people continue to be. Housing, fishing, hunting, gathering, storing, clothing, carrying, transportation, cooking and ceremony are included. This book is part of the Nunavummi Reading Series, a Nunavut-developed series that supports literacy learning while teaching readers about the people, traditions, and environment of the Canadian Arctic. It is a Level 9 book in the series. Curriculum Connections: Language and literacy; Diversity; Indigenous perspectives; History; Heritage. 20 pages | 6.00" x 8.00"
Nunavummi Reading Series: Grandma, What's an Ulu For? Ulus are used for a lot of things! In this book, a grandmother demonstrates how to use an ulu to her grandchild and talks about its history, traditional uses, and stories about it. This book is part of the Nunavummi Reading Series, a Nunavut-developed series that supports literacy learning while teaching readers about the people, traditions, and environment of the Canadian Arctic. It is a Level 10 book in the series. Nunavummi Reading Series books have also been officially levelled using the Fountas & Pinnell Text Level Gradient™ Levelling System. This book's F&P Level is M.
28 pages | 9.00" x 7.00"
Nunavummi Reading Series: Grandpa, How Do I Build an Iglu? Find out how to build an iglu! In this book, Grandpa explains to his grandchild how we make iglus today, how and why they were made traditionally, and stories about iglus. This book is part of the Nunavummi Reading Series, a Nunavut-developed series that supports literacy learning while teaching readers about the people, traditions, and environment of the Canadian Arctic. It is a Level 11 book in the series. Nunavummi Reading Series books have also been officially levelled using the Fountas & Pinnell Text Level Gradient™ Levelling System. This book's F&P Level is O.
Curriculum Connection: Language and literacy; Diversity; Indigenous perspectives; Environmental Awareness; History; Heritage.